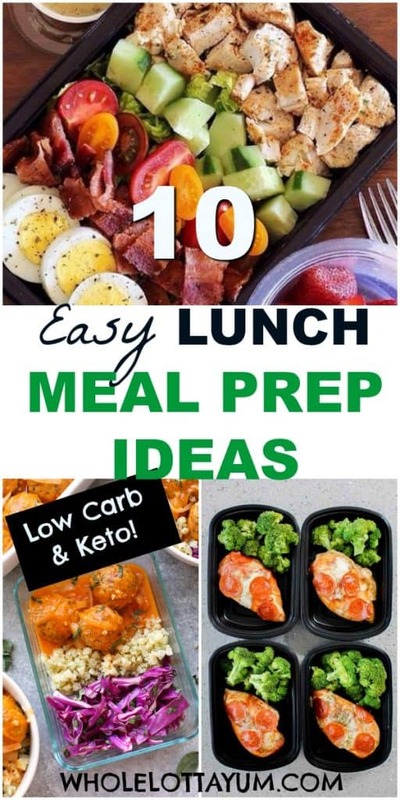 Are you having a hard time coming up with your low carb and keto lunch ideas? I hear ya! 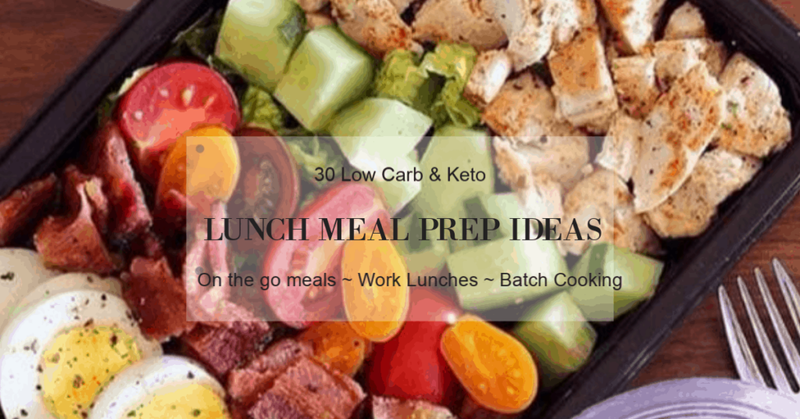 It’s something we struggled with too until we started planning ahead and making easy keto meal prep lunches! 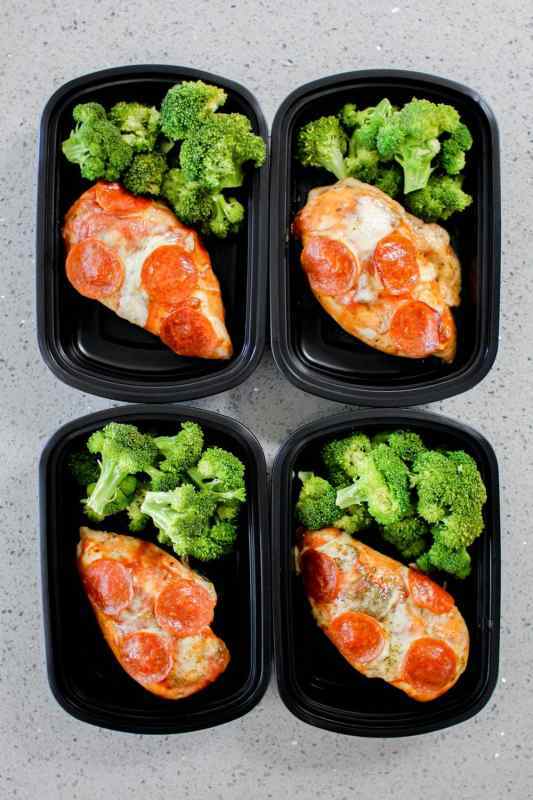 Healthy meal prep ideas make it so much easier to stick to your low carb or keto meal plan and makes it easier to skip the take-out at lunch. The first step to creating amazing and easy low carb lunch ideas to meal prep is making sure you have the right tools for the job. We personally love to use glass containers that store well, can be reheated, and can even go in the freezer too. 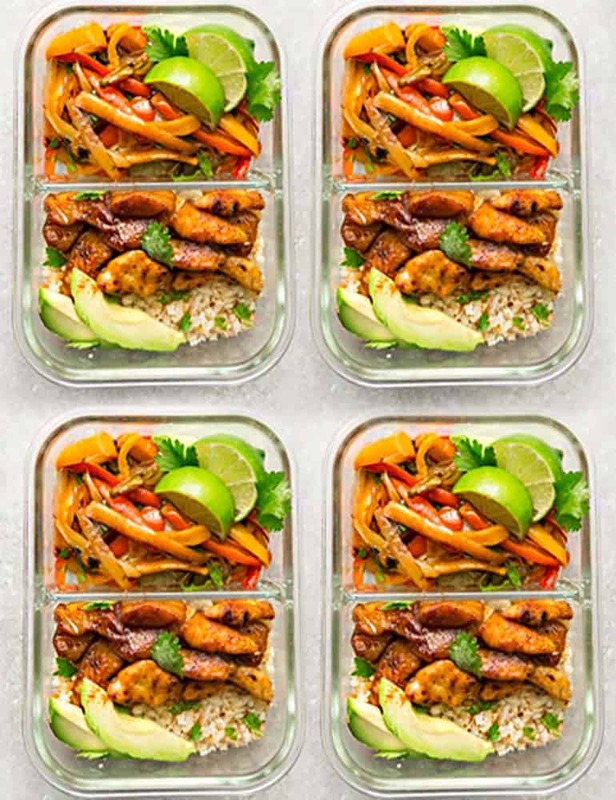 Plastic BPA free meal prep containers – We love these, especially for meals that don’t need to be reheated, but even if they do, they’re BPA free. 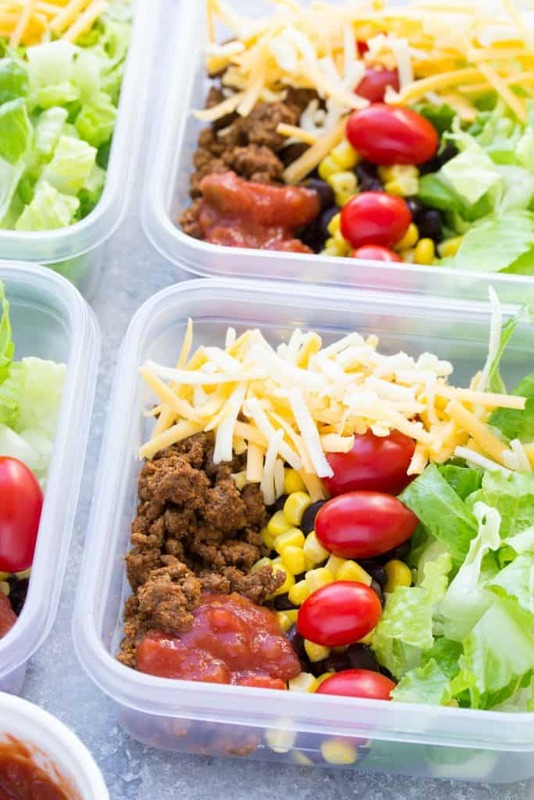 Buying a sturdy plastic container is the least expensive way for low carb and keto meal prep. Glass Meal Prep Containers – 5 pack – Glass meal prep containers work great for your low carb lunch, they heat well and are very sturdy. The downside to using glass is they’re heavier, they cost more and don’t stack as well as the plastic containers. Brandon Hearn has a highly rated Keto Meal Prep Cookbook you can actually read for FREE if you have an Amazon Kindle subscription. If you don’t have Amazon Kindle you can also try it one month for free to download lots of healthy and low carb cookbooks. That’s what we did to download free travel books before we went to Europe last summer. Pizza chicken? This is definitely a win! You still get your favorite pizza flavors but lighter and without the high carb crust. This makes a terrific low carb lunch and would surely be a family friendly healthy weeknight dinner too! Make sure to double the recipe so you can include this in your keto meal prep ideas. This yummy and gooey chicken pizza cooks up in less than 30 minutes from start to finish. Life Made Sweeter prepares this on a sheet pan, and offers both a low carb chicken fajitas version and also an option for those wanting corn tortillas too. Fajitas of all kinds is one of our favorite low carb lunch ideas since it cooks up fast and stores well in the freezer for batch cooking. We often use precooked chicken and frozen mix bell peppers to whip up fajitas in a flash. Substituting beef, pork, shrimp or portobello mushrooms are great low carb fajita options so you can vary things up. So many asian dishes are filled with sugar, MSG and other ingredients we just don’t want to eat. Finding healthy versions of our favorite take out dishes makes sticking to a low carb lifestyle so much easier. 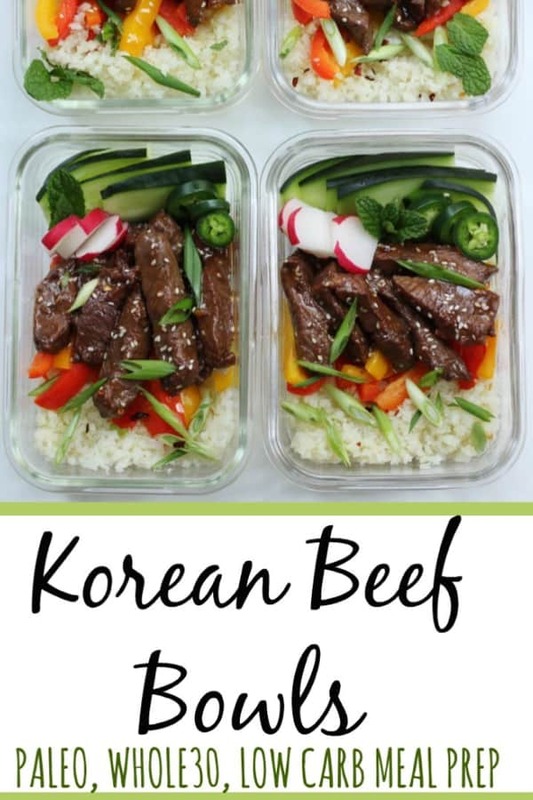 These super yummy low carb Korean beef bowls by Bailey of Whole Kitchen Sink are the perfect solution! You won’t ever miss the sugary sweet sauce since this includes so much flavor. The recipe makes 4 servings, so this is definitely a low carb lunch I’d want to eat 4 days in a row! I don’t know about you, but shrimp and noodles is one of my favorite combinations. 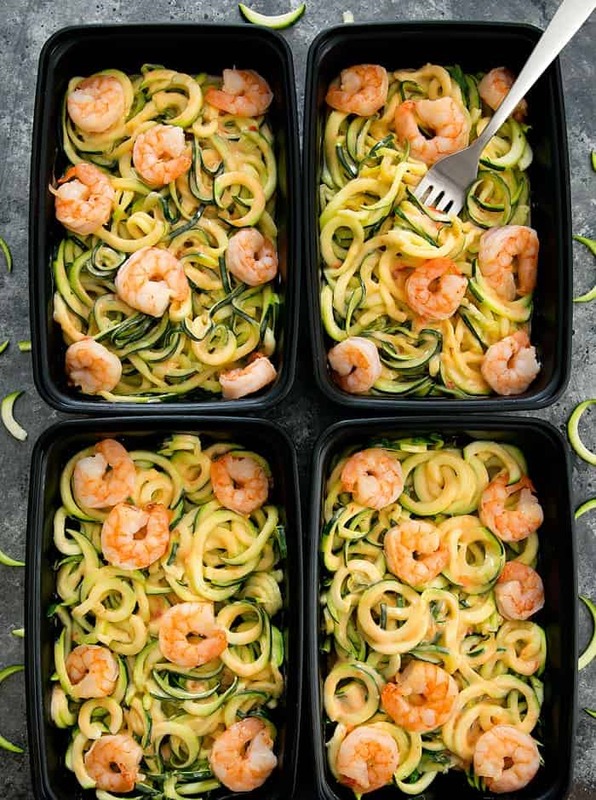 What’s even better is that you can whip this dish up in under 15 minutes whether you’re in a hurry on your way out the door, or you’re looking for speedy low carb meal prep ideas to make on the weekend. This particular recipe has 13 net carbs since she uses honey and a sweet chili sauce to sweeten the recipe. This will of course work for a low carb lunch, but if you’re looking for keto meal prep lunch ideas, you can make easy substitutions by using stevia to sweeten instead of the honey and by skipping the chili sauce and adding sriracha to add a kick to the flavor. What I love about this low carb lunch meal prep idea is that other than the meat and making hard boiled eggs, you simply add in any leftover vegetables you have in your fridge. Very resourceful and easy! 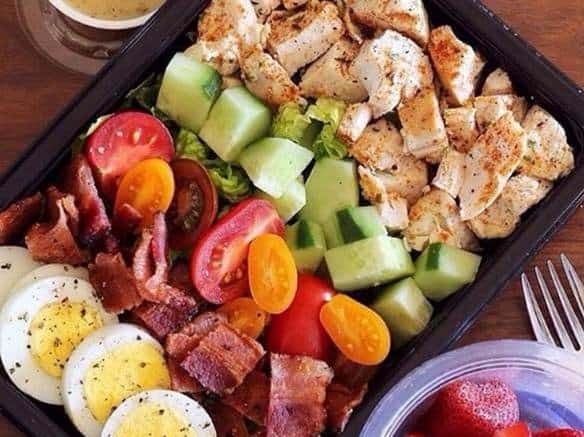 Making a meal prep salad is even easier when you start with precooked chicken, bacon and hard boiled eggs. Although this particular idea includes beans and corn, you can easily add in more protein to keep your carb count down! Many packaged taco seasonings and salsas unnecessarily come with sugar, be on the lookout for brands that don’t or make your own healthy version. My sister from Seeking Good Eats has a much healthier taco seasoning option that you’ll love! 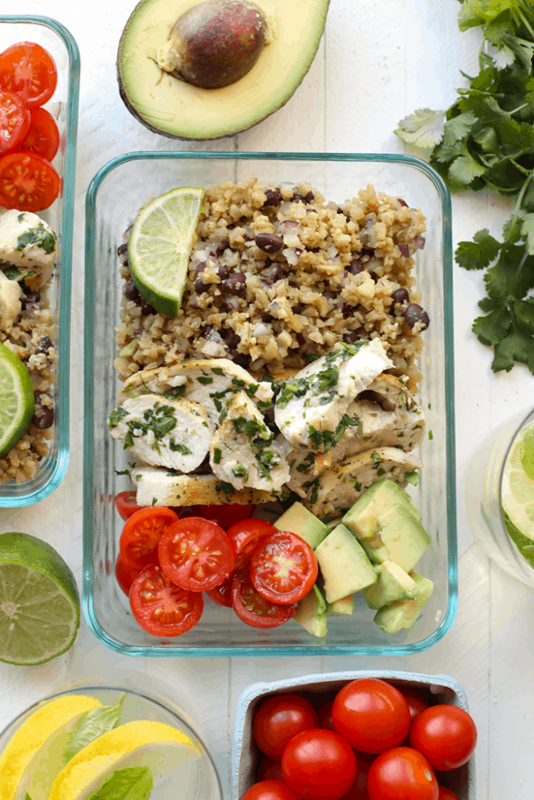 This cilantro lime chicken with cauliflower rice will definitely become one of your low carb lunch favorites. The chicken cooks up in a flash and you can simply add whatever veggies you have on hand in your fridge. She does mix in a small about of black beans with the cauliflower rice, if you’re following a keto diet then just leave them out, but even as is the recipe is still only 9 net carbs per serving. 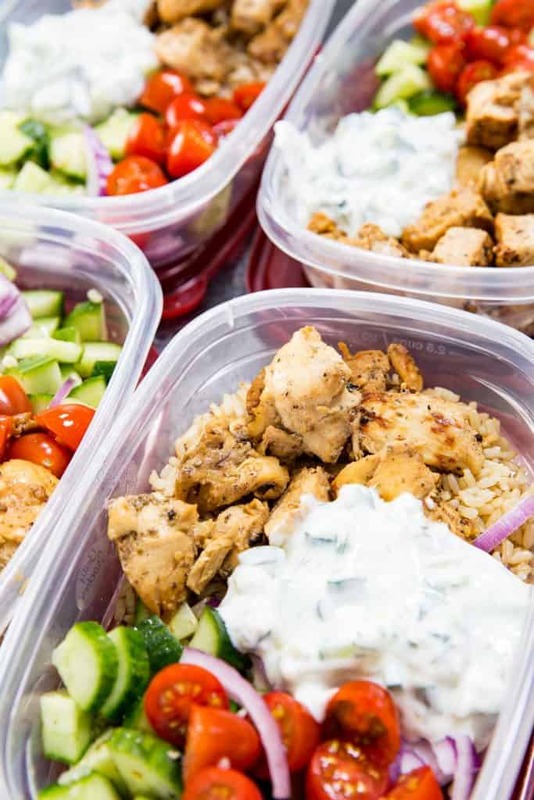 This incredible recipe for Greek meal prep chicken makes 6 servings and will feed you a low carb lunch for days on end. One trick to keep the cucumbers crisp and fresh is to use English cucumbers instead of your standard grocery store cucumbers. The chicken is so good in this recipe you’ll find yourself making it just to eat on it’s own for dinner too! While she does use a bed of brown rice, to keep this as low carb and keto friendly as possible, make sure to put on a bed of cauliflower rice instead of just skip it all together. 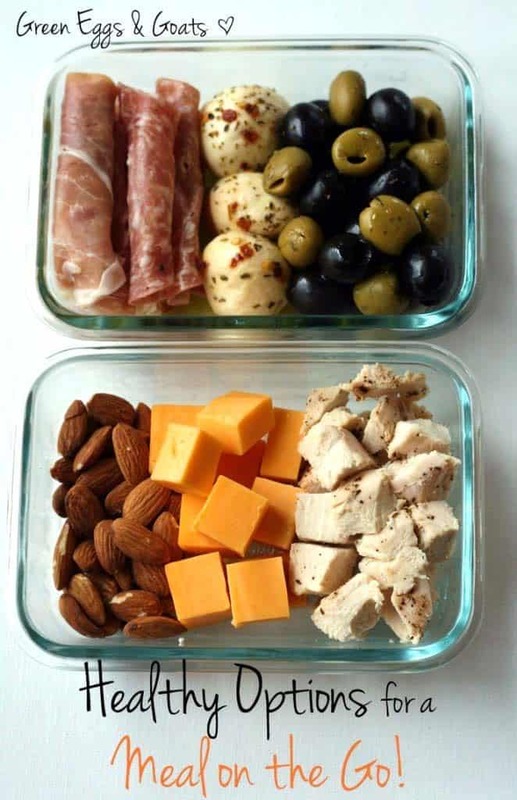 Putting together quick and easy protein packs is one of my favorite low carb lunch ideas. You don’t even have to cook anything and just assemble ready to go low carb items from the store or even add in cubes of leftover meat in your fridge. 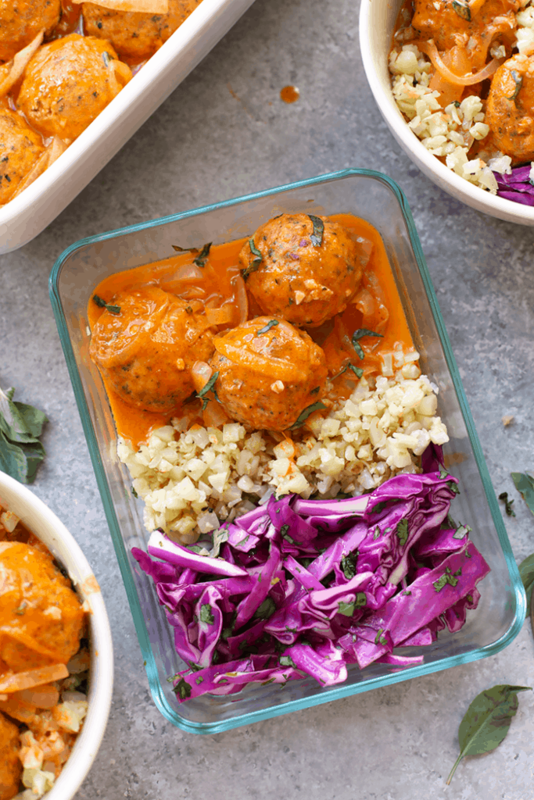 Here’s another wonderful low carb lunch meal prep idea from Fit Foodie Finds, I don’t know about you, but we’re curry obsessed here at WLY and could eat it over and over again. She uses a little rolled oats in the meatballs, if you’re looking for a keto lunch meal prep idea, you can simply substitute almond flour for the rolled oats. We always use almond flour as a binder for any meatballs we make and it works like a charm. Baked turkey meatballs meal prep – Served with sauce and spiralized zucchini, freezes well too! 20 minute beef stroganoff – One of our personal favorite keto meal prep ideas, you can easily substitute ground beef, turkey or chicken for the steak strips. This is also paleo and pairs well with riced broccoli or cauliflower. Low carb charcuterie plate – Assembling a mini grab and go low carb and keto charcuterie board is another easy 5 minute keto meal prep idea. We always try to keep no carb and low carb ready to go healthy snacks in the fridge like cheese balls, olives, salami, celery, low carb nuts, celery and artichoke hearts. Low carb chicken salad – Chicken salad with precooked or canned chicken is one of our regular low carb lunch options and can easily be whipped up in only 5 minutes. We love to stock up on canned chicken from Costco to be even more frugal. This is a great recipe when you need to make a low carb lunch the morning of as you’re running out the door! Smoked salmon lunch box – The Kitchn not only has easy to assemble keto meal prep ideas with smoked salmon, but their posts also includes numerous other great quick lunch box swaps. Baked Omelet Cups – Eggs aren’t just for breakfast anymore! These easy baked omelets are portable and make a fantastic lunch or snack on the go. Keto Italian Sub Salad – I promise you’ll never even miss the bread when you take all of the toppings from an Italian sub sandwich and turn it into a hearty salad. This truly makes the best low carb lunch or keto meal prep idea and it keeps well in the fridge so you can eat it multiple days in a row. Spicy tuna stuffed avocado– If you’re a sushi lover, you’re in for a treat. You’ll never miss the rice with this sushi inspired spicy tuna stuffed avocado made with sushi grade ahi tuna. Keto mini meatloaves – Having your own mini meatloaf makes meal prep easy. This is a terrific meal to prep on a Sunday and get your protein for 5 days of work. Buffalo Chicken Celery Sticks– These yummy 10 minute buffalo chicken celery sticks not only make a great low carb lunch, but they’re perfect as a party appetizer, snack on the go or even as a light dinner. Here’s more keto buffalo chicken recipes if you’re as obsessed with buffalo chicken as we are. Bacon and Cheese Pinwheels– If you believe everything is better with bacon, than these quick and easy pin wheels will make the best low carb lunch for you. The recipe whips up in 30 minutes and makes 10 servings. The hard part will be keeping them away from others! Keto chicken broccoli casserole – When you start with precooked chicken, this casserole is done from start to finish in less than 30 minutes. Yummy and easy keto casseroles is one of our favorite low carb lunch meal prep ideas since they’re quick to put together and can easily give you 6-8 servings from one pan. Smoked Salmon Frittata– This is a popular and amazing recipe from my sister’s blog, Seeking Good Eats, she’s a frittata master since she has a constant supply of eggs from her 25 chickens! Frittata’s make a yummy low carb meal for breakfast, lunch or dinner and it can be served warm or cold. Philly cheesesteak wraps These keto philly cheesesteak wraps come with a link for a low carb tortilla, you can also use lettuce leaves or just eat the harty filling out of a bowl. 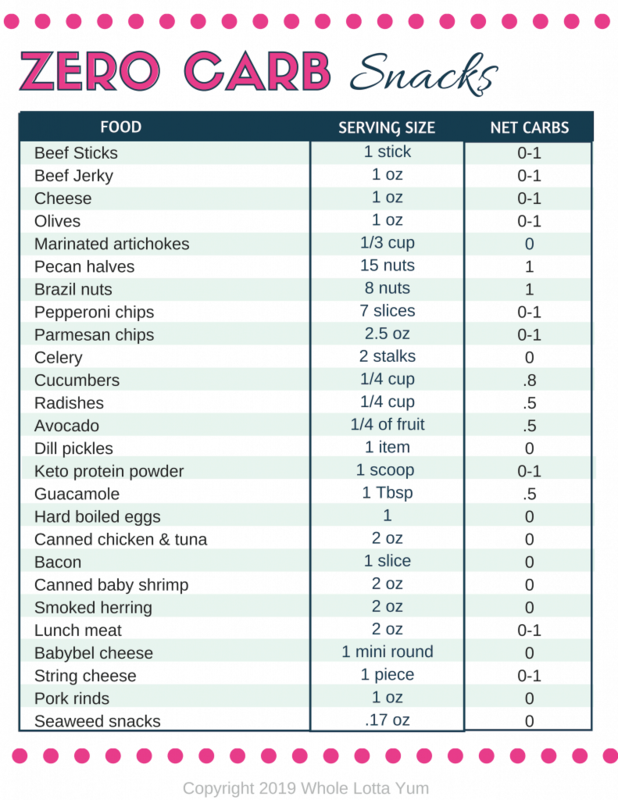 Be sure to download our full list of thirty 0-1 carb snack ideas! Where Can I Get a Low Carb Lunch? If you’re on the go and forgot to pack your low carb lunch in advance, here’s an entertaining video by Keto Connect that includes the best 5 low carb and keto fast food stops and what to order. 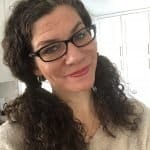 Informative and well written article, thanks for sharing these 10 keto lunch meal. This is very helpful. Thanks Steve! 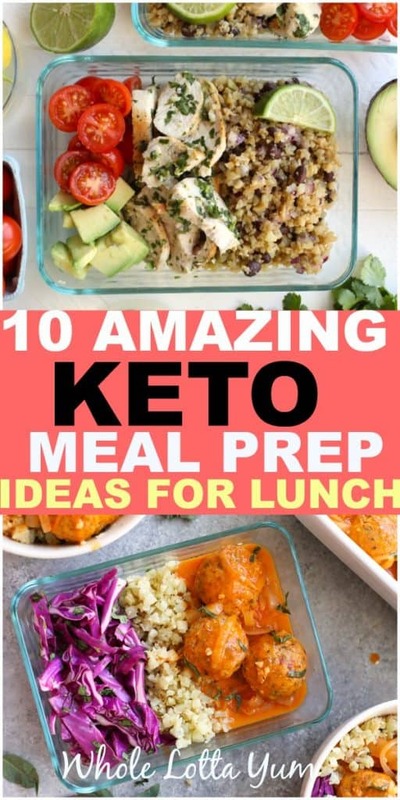 I hope you enjoy the keto lunch ideas!